None of these options are important for the normal use of Drive Snapshot; usually you should use the default settings. Disk image files can become rather large, if saving big partitions. However they should not be larger then certain limits, else they will not be usable by DOS (limit = 2047 MB) or will not fit on a CD-R/W (Limit 650-750MB)or an ISO-DVD (Limit 2048 MB). By default the limit is 1500 MB, so 3 image pieces fit on a DVD. This saves each and every cluster on the disk, ignoring the free space information. This has its use if you are trying some 'Data Recovery' Tool to recover some data from a damaged disk, but want to be able to restore the original state in case the 'recovery' fails. 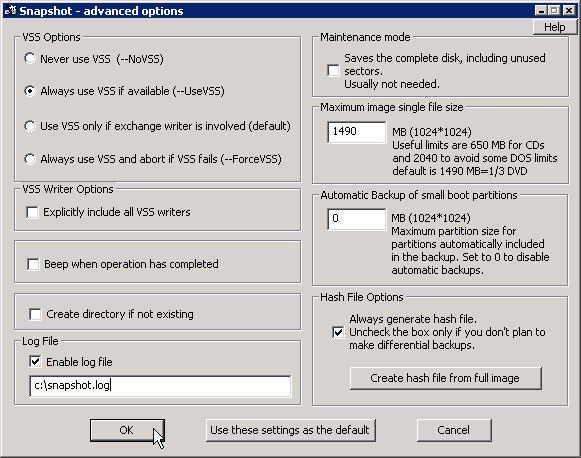 Usually, with each full backup, also a .HSH hashfile is created, which is used for differential images. If you don't plan to use differential backup, clear this option. with [Create Hash file from full image] you can recreate a .hsh file from the full image. Saves these settings to be used as new default settings.